Box to box: who’ll be on target at May's elections? As a remarkable Premier League season hurtles towards its potentially unprecedented conclusion, another campaign is also entering the final straight. Although perhaps lacking Riyadh Mahrez’s flair, Claudio Ranieri’s ingenuity or the King Power Stadium’s raucousness, the forthcoming elections on May 5th could, like Leicester City Football Club, grab our attention before we spend the summer focussing on European issues. Compared to last year’s General Election and this June’s EU Referendum, the prizes at stake are slightly less glittering. However, with 2,743 seats in local councils up for grabs, as well as the Scottish Parliament, Welsh Assembly, Northern Ireland Assembly and mayoralties in London, Bristol, Salford and Liverpool, there is plenty to play for. Above all, however, this set of elections will be an important opportunity to assess the main parties’ fortunes one year on from the General Election. Traditionally, opposition parties tend to fare well at local elections as the public uses these ‘second order elections’ to express its displeasure at the Government. Both Michael Howard and Ed Miliband enjoyed local election success before General Election defeats, while Labour lost councillors every year between 1996 and 2009. But this election looks set to be different from others, because the opposition Labour Party has a lot of seats to defend (1,337) and its scope to gain more seats is therefore relatively limited, as well as because its leadership is particularly unpopular - in the February 2016 ComRes Favourability Index poll, Jeremy Corbyn was the politician with the worst ratings (21% favourable v 50% unfavourable). London tends to be more Labour-friendly than much of the rest of England. 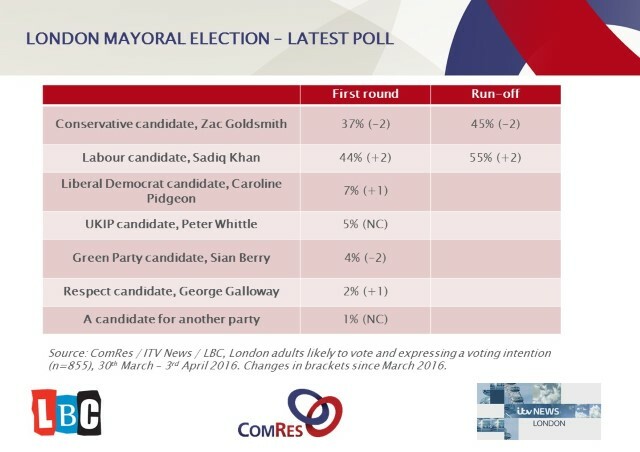 As a result, any Labour candidate should start as favourite in mayoral elections, and this is borne out by the latest ComRes polling where Sadiq Khan leads Zac Goldsmith by 10 pts. A loss for Labour and Sadiq Khan has the potential to spell a disastrous night for Labour, but victory in the capital city would represent a valuable three points in what may otherwise be a set of results with little to shout about. With Jeremy Corbyn’s success at last year’s Labour leadership elections widely attributed to his particular popularity among the young, these bastions of youth will provide an indication of whether his appeal can be stretched to other like-minded demographics beyond Labour’s grassroots - even if young voters are not necessarily the key to General Election success. Aspiring to succeed where Chelsea FC have failed and consolidate their May 2015 success, the SNP appear set to strengthen their position in Holyrood. As elsewhere, however, it will be important to watch Labour’s performance – they are more likely to be looking backwards over their shoulder at the Conservatives than ahead to the SNP. While not quite on a par with Leicester City’s meteoric rise, the Conservatives’ steady advance in the Midlands has been central to David Cameron’s success at the 2010 and 2015 General Elections. As a result, councils such as Cannock Chase, Dudley, Walsall and Solihull (which are either under Labour control or No Overall Control) represent key Conservative-Labour battlegrounds on May 5th. In particular, if Labour lose Redditch to Conservative overall control, this will indicate that Labour have had a poor rather than just an average night. 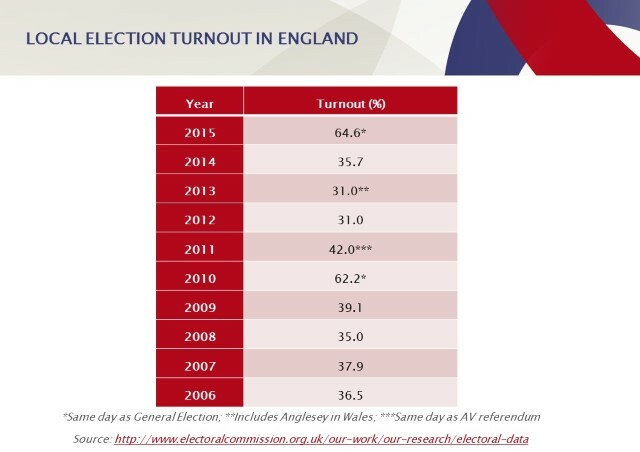 ComRes has repeatedly highlighted the importance of turnout in elections – and the upcoming elections are no different, as ultimately these various elections will be determined by those who turn up and vote. In these circumstances, party strategy is less focussed on the classic ‘swing voters’ of General Elections and more on getting out the core vote. The political parties will be targeting their ‘diehard fans’ and trying to ensure that they make the trip to the ballot box in a few weeks’ time. The extent to which the ability of the traditional party machinery to do this will be compromised by concurrent campaigning on the EU Referendum remains to be seen. Rather than the Premier League, then, it may be more accurate to compare the upcoming elections to the FA Cup. In the same way that a good run in the cup doesn’t guarantee league titles, a strong performance at May’s elections will not necessarily translate into General Election success. We are unlikely to learn too much about the outcome of GE2020 from next month’s elections – but the results could have longer lasting repercussions on internal party politics.